A morning meal has become increasingly easy to acquire for residents of tech hubs such as San Francisco and across Switzerland’s finance capitals, while people in Egypt, along with much of Sub-Saharan Africa have to work much longer to pay for their first meal of the day. 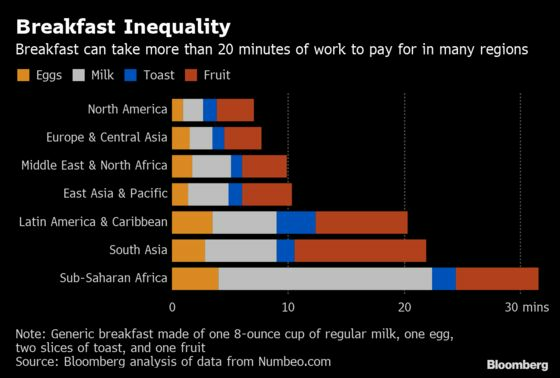 The latest edition of the Bloomberg Global City Breakfast Index calculated the relative daily costs and time needed to work to earn a glass of milk, one egg, two slices of bread and a serving of fruit. Rankings are based on self-reported market prices as of December 2018 from Numbeo.com, an online database of user-contributed city and country statistics in more than 100 locations. In just four cities, a standard breakfast made up less than 1 percent of daily income: Geneva, Dubai, Luxembourg and Bern, Switzerland. This contrasts with residents of Accra and Lagos, who must shell out more than a quarter of their daily income for an identical meal. Compared with the inaugural Breakfast Index in 2017, residents of Switzerland are better off now as incomes have increased at a greater pace than basic food prices. Of the top 20 most-affordable cities, five were in Switzerland and five were in Australia. It’s also important to note that typically as income rises, the proportion spent on food falls even if the absolute cost of food increases. 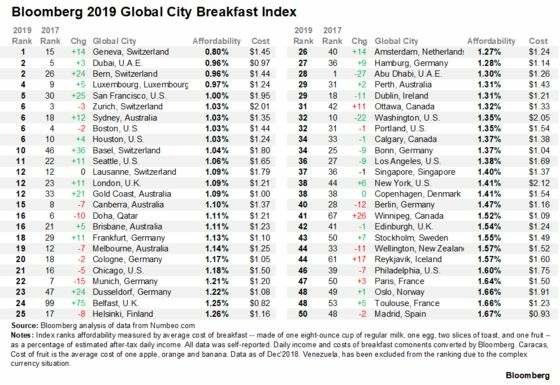 Among the major U.S. cities in the analysis, San Francisco, Boston and Houston provided the most affordable breakfasts, while Miami and Philadelphia ranked at the bottom. Hangzhou, where Jack Ma staked his Alibaba headquarters, emerged as the costliest among the five locales from mainland China. An average citizen there had to work 30 minutes to pay for breakfast. To access full data set for the index, click HERE. Breakfast cost the most at $4.45 in Hamilton, Bermuda. That’s up from $3.48 in the previous gauge. Just 2 percent of residents there were employed in agriculture and most food items are imported.